Mad For Garlic is a first garlic-theme Italian restaurant originated from Korea. The first restaurant open its door in 2001, in Southern Seoul. 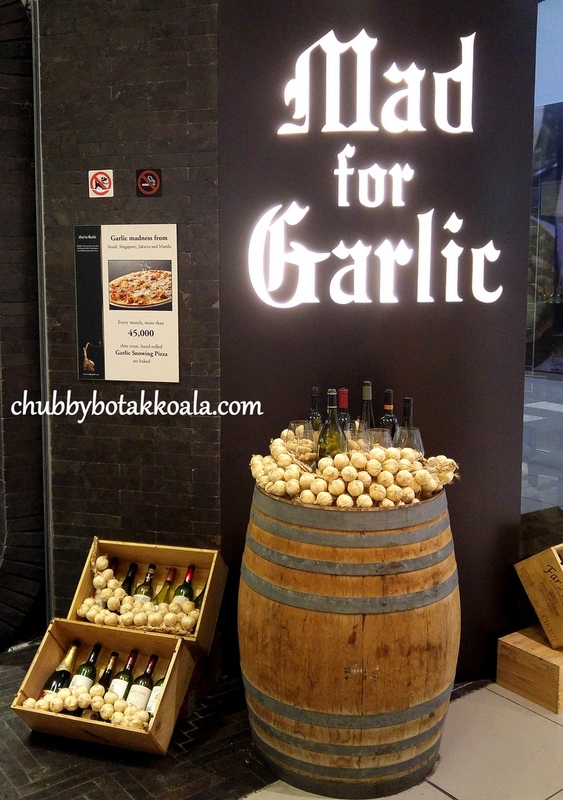 Due to its unique and innovative garlic specialised menu, Mad For Garlic ('MFG') become one of the most popular Italian restaurants in Korea. They even won Best Performing Italian Restaurant Concept in Korea in 2013. 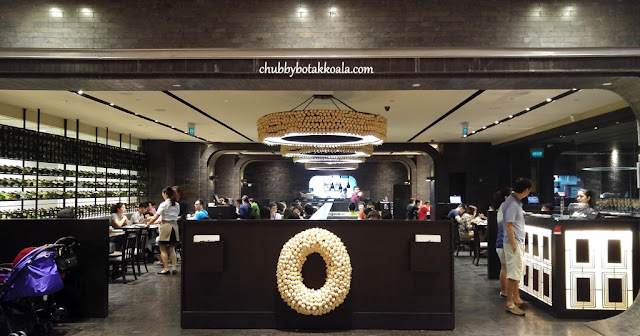 MFG Suntec City is the first overseas restaurant outside Korea, which started its operation in 2010. We started with Sauteed Mussel ($31.50). There are two options of the sauce, tomato or garlic cream. Garlic cream sauce got our vote. The mussels are plump, juicy and succulent. The cream and mince garlic work wonders to accentuate the flavour of the mussels. 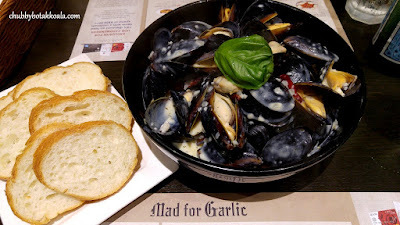 We used the soft bread to soak up all the mussels goodness in the gravy and polished it off. Well since both LD and I are really have cravings for red meat that night, we both ordered steak. 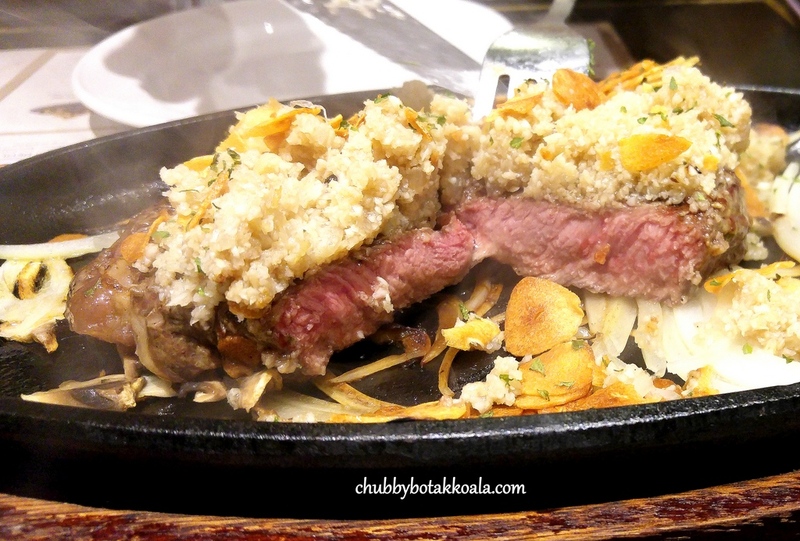 Her version is Garlic Steak ($37.50). 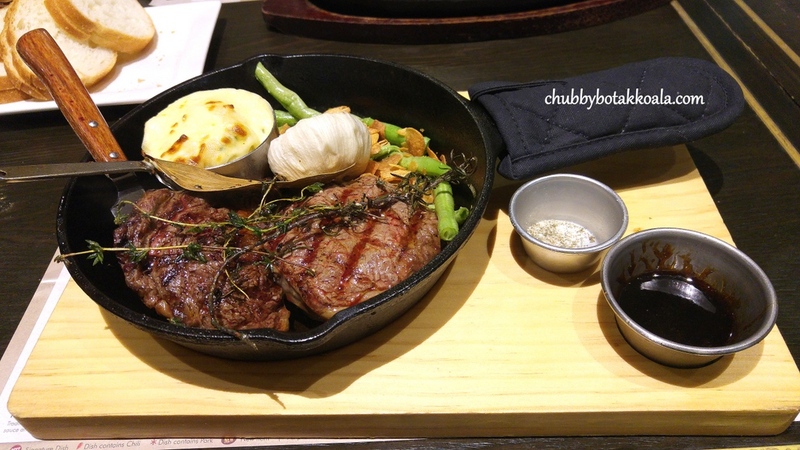 Rib-eye steak served on a hot plate, it was still sizzling when it arrived on our table. Presentation look a bit old style, like those you find in Jack's Place, but the taste is definitely out of ordinary. She asked for Medium rare and that's what she got. 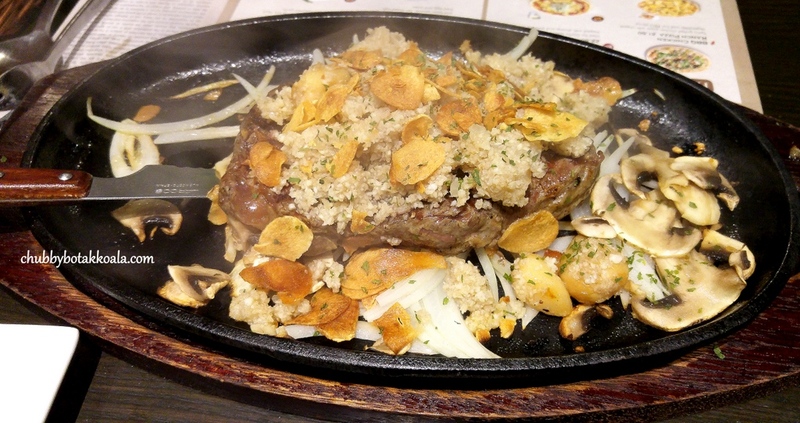 On top of the steak, there are two type of garlic, minced and fried sliced garlic. The mince garlic has a mild sweet texture to the dish, while the fried, was crunchy and bitter. Surprisingly, it goes well with the steak. Yum Yum. 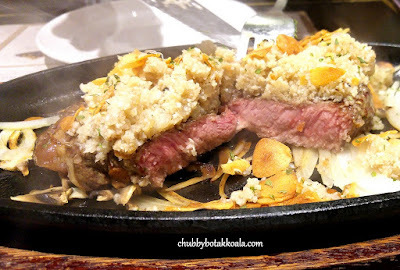 My pick was Grilled Herb Steak with Cheese Gratin ($37.50). Served on a cast iron got place was two piece of rib-eye. 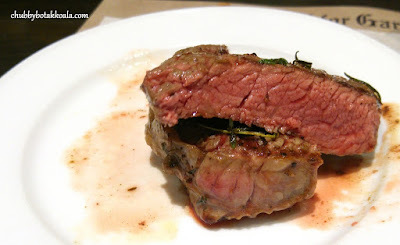 Grilled with aromatic rosemary and whole garlic, it really wake up your appetite. The grain was cheesy and creamy, which I find goes well with the fried slice garlic. The meat was nicely cooked to medium rare as per order. There was a sauce on the side with salt and pepper, to complement your steak. Service is prompt and no fuss. The décor is bright and modern with a family-friendly concept. I like the prominent garlic there that hanging outside the restaurant and also surrounding the lightings in the mid section of the restaurant. Overall, Mad For Garlic truly brought to live the garlic-theme restaurant. The combination of proteins with the garlic are in sync, you will think of it as the dishes that you eat normally. Definitely a place to try plus with a bonus that no Vampire will dare to look for you afterwards. Cheers!! 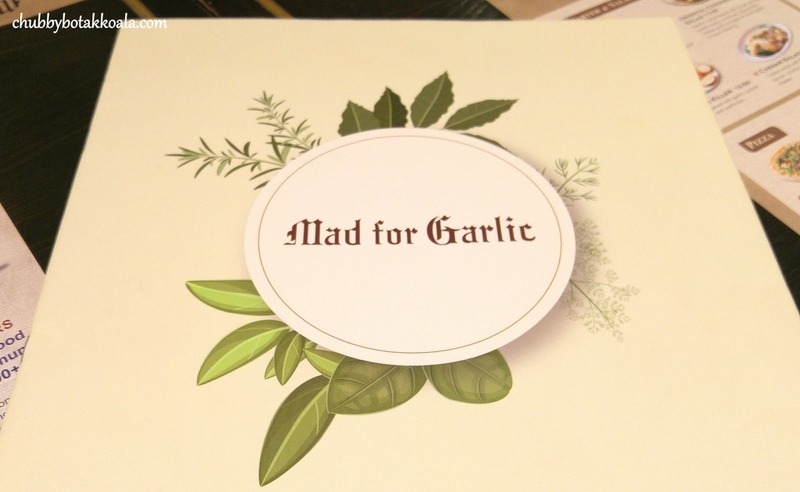 We used our Entertainer Apps in Mad For Garlic, One for One Main Course for this dinner. Note: You can use The Entertainer App here and get a complimentary Main Menu Item when a Main Menu Item of equal or greater value is purchased here. Offer valid for Singapore in 2016.